Clean-up crew clowing around during the rain. 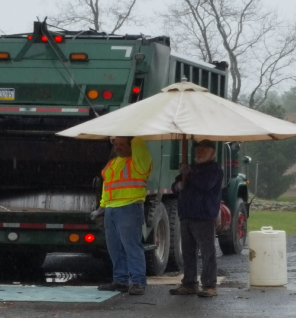 On May 7th, Dingman Township held its annual Spring Clean-up and Electronics Recycling Day despite the rain and gloom. While it is too early to provide all the totals, the recycling portion of the event appears to have been quite successful. These will all be taken for proper recycling. A dozen cell phones were dropped off. Working and easily repairable cell phones will be refurbished and provided to women's shelters around the country. Those that are not workable are recycled. Three 5 gallon buckets of consumer batteries were collected and shipped to the appropriate recycling facilities. (Note: Consumer batteries may also be dropped off at the township building, work days between 8:30 and 4:00 PM). Three car type batteries were collected for recycling. Car batteries may only be brought to clean-up days. About 70 yards of scrap metal and white goods were collected for recycling. Items with Freon will have the Freon removed and recycled. At this time the number of tires to be recycled and waste material that will be landfilled is not known. It shall be reported at a later date. Missed Spring Clean-up and Electronics Recycling Day? Then plan on hitting Dingman Township's annual Fall Clean-up and Recycling Day on September 17th 8AM til Noon.